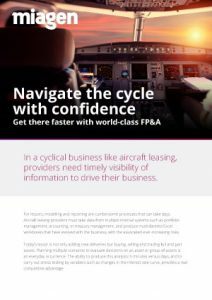 Many aircraft lessors are held back by cumbersome processes for modelling and reporting, stifling their ability to plan and analyse quickly. Miagen has produced this short white paper to show the benefits of consolidating multiple reporting tools in a single financial performance management system. Lessors can gain competitive advantage by quickly seeing KPIs, checking performance at multiple levels of consolidation from PSV to parent, or drilling down to individual aircraft level. With the ability to model market trends on a monthly, quarterly or yearly basis and more, they can drive better business decisions.